A warm welcome awaits you at Ballamenagh, a self catering studio apartment overlooking the TT course and the Irish Sea. The studio has two bedrooms, one double and one twin; bathroom with over bath shower; a spacious living room with TV and video; and a fully equipped kitchen (with washing machine and dryer, dishwasher, fridge freezer, microwave and electric cooker). To the rear are our hillside fields where you are welcome to walk. 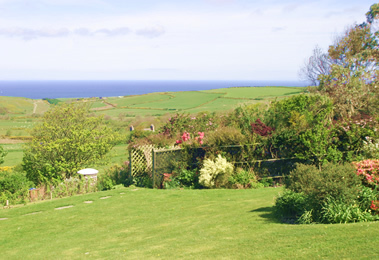 The secluded gardens are perfect for watching glorious sunsets over the Irish sea and afford views of the Scottish and Irish coastlines. The studio is situated at Handley’s Corner, close to the village of Kirk Michael on the island’s west coast. There is a limited bus service to the village, where you can pick up onward connections to Peel and Ramsey. The village has a Post Office, bank, general stores, butchers, pub and churches. There are several beaches within the area, and lovely wooded glens which are a delight to walk in. 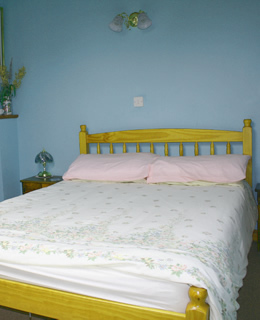 All linen and towels are provided, and the price is inclusive of oil heating and electricity. A deposit of £100 is required to confirm a booking, with the balance payable two weeks prior to your arrival. Web design by 21 Inspired, Newcastle UK.